Tauriel may only seem to be a common wood elf, but her skills make her anything but. Her preferred melee weapon is double daggers, whose unique design boasts a fine look to mark her as a ranked warrior within the court. As her personal weapons, the Fighting Knives of Tauriel are exceedingly fine in craft, being made with bronzed steel and sylvan steel edges, as well as greenwood hilts with steel fittings. 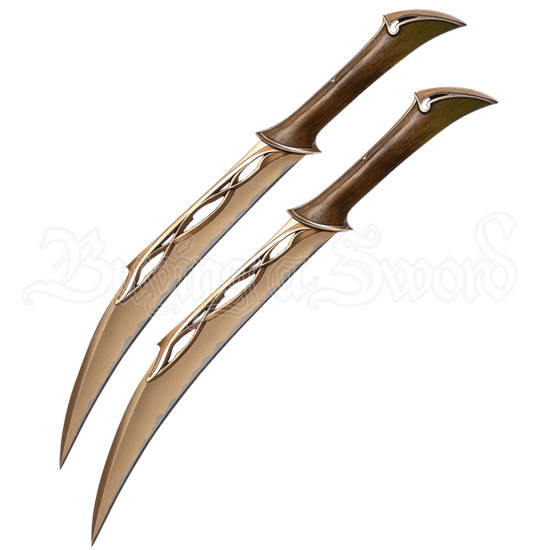 These replicas recreate the form of the daggers in more modern materials, with cast stainless steel blades that have a bronzed finish, as well as cast metal and polycarbonate hilts. The daggers come with a wooden wall mount with a Tauriel graphic, as well as with a certificate of authenticity. The Fighting Knives of Tauriel are stunning to behold, and with their sleek look, they are a great collectible for any fan of this skilled she-elf to own, display, and even show off from time to time.